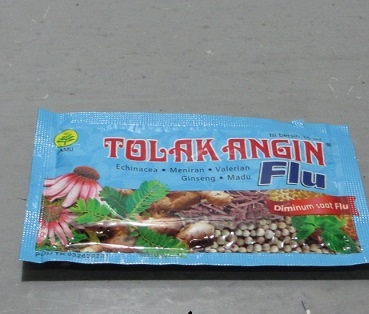 Tolak Angin - Good For Common Cold and Its Symptoms Good for common cold and its symptoms such as fever, headache, sore throat, nausea, flatulence, abdominal pain, feeling of cold, sore eyes. Also maintain body defence mechanism during hard work, staying up all night and traveling far distances. Ingredient : Oryza sativa, Foeniculi Fructus, Isorae Fructus, Caryophylli Folium, Zingiberis Rhizoma, and other ingredient in extract form. Direction : Take 2 x 1 sachet of Tolak Angin daily with a glass of warm water. Package: 10 sachets For men and women.